I’ve wanted to address this issue for a long, long time. No doubt anyone who watches the ABC show ‘Shark Tank‘ has become familiar with the usual suspects: Barbara Corcoran, Daymond John of FUBU, ‘Mr. Wonderful’ Kevin O’Leary, Mark Cuban, Robert Herjavec, and Lori Greinier of QVC. However, having gone through that listing, something seems a bit off…doesn’t the ‘tank’ only house 5 chairs? For some reason, there have always been the same four men sitting in each of the chairs season after season (with the exception of Kevin Harrington in season 1, and Jeff Foxworthy in season 2). Despite the fact that both women are featured as part of the current season’s cast, the two women are never seen together on a single episode. Is this perhaps meant to be a reflection of the disparity of women on corporate boards? Though I have been all-to-ready to hop onto the couch and tune in to watch hopeful Americans see their dreams fulfilled or squashed, the gender inequality represented by the ‘lone woman shark’ had never struck me so much as it has in the current season. In this season of Shark Tank, Lori and Barbara are swapped in and out like accessory handbags while the panel of men is left unaltered: Mark is always beside Daymond, who is always beside Mr. Wonderful, who is beside Barbara/Lori, leaving Robert off in the far corner. 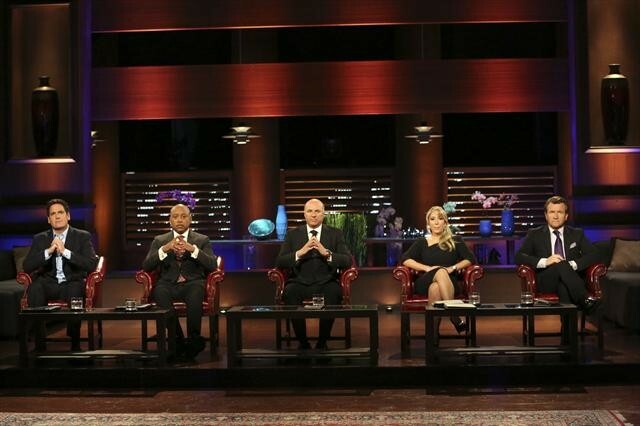 This lineup indicates that the only apparent spot for women on Shark Tank is between Robert and Mr. Wonderful, or nowhere at all. Perhaps Shark Tank, like these businesses Krawcheck mentions was under stress to maintain the ‘look’ of the sharks by keeping them predominantly middle-aged and male because that is what their audience is so accustomed to seeing. One thing I wouldn’t mind seeing if having one of the men replaced to accommodate Barbara Corcoran…or better yet, swap out O’Leary for a successful woman of color, or a woman of color who is an LGBT advocate. Why not just switch up the ‘panel’ on a show-to-show basis using a more diverse allotment of sharks? If it’s true what they say about there being plenty of fish in the sea, surely there must be plenty of fresh sharks to choose from. I like your suggestion about switching-up the sharks simply from an entertainment standpoint. It would make the show more interesting if the sharks were more diverse. New people and ideas bring new perspective, which is always a good thing. Really interesting post, Chaz! My husband loves the show (mostly the business men bickering), but I’ve noticed the seemingly strict 1 Woman to Infinite Men ratio. Like you, I can’t quite understand why it would be such a huge leap to let both ladies advise on the board at the same time! I love your point, though. I think there needs to be MUCH more diversity! Mmmm. You make a good point that I had never really thought about. Interesting POV for sure. Now I’d kind of like to see an all female tank. A to the Men on this. I have wondered the same thing. It’s like there is only room for one woman. Hmm. I do like The Shark Tank and have been bothered by the token woman. 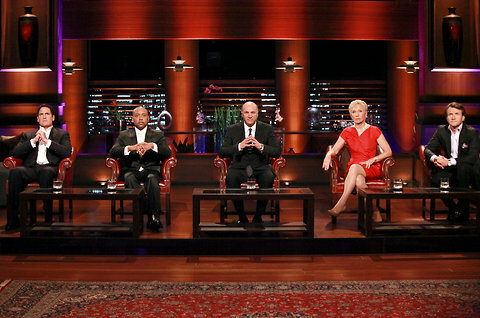 If you compare the 16% women on boards to 1 out of 5 on The Shark Tank, the percents are pretty close. Good point about Robert being off on the side. I wonder why they keep him even though in many ways he’s my favorite. He definitely is also marginalized in the “deals”. Enjoy your SITS Day. I’ve only watched the show a time or two, but I do think it’s odd they only ever have one woman at a time. I have seen the show only once but you bring up a very valid and interesting point! Diversity would probably make me more interested in the show as well! WHOA Miss Lady! I’m visiting from SITS and I wasn’t ready for this. I was all like oh this recent college grad, this should be fun to read and you are heavy duty! I watch Shark Tank every week religiously and I often wonder what is up with the swap of the ladies but I didn’t get that far into thought on it. You are right to call them out on it. I too would appreciated more female sharks, minorities, and more than 1 women at a time on stage. Amazing post! Hapy SITS day again. You know what? I bet they have trouble finding women who want to be on this show. At least that’s what I’m telling myself. Because if there are lots of women out there to choose from, then Lord help us! Such a great point. I watch Shark Tank on a semi-regular basis (boyfriend loves it) and I remember wondering at the beginning of this season if they’d ever have Barbara & Lori on at the same time. I’d love to see that for the reasons you listed, but also I want to see their interaction. There are a handful of businesswomen who think they have to fight other women to get to the top, when that’s not really true. And it shouldn’t be true. I would like Shark Tank to put both women on (and like you suggested, other powerful women) at the same time and showcase how working together (instead of against) makes women incredibly powerful and creates amazing results! I love Shark Tank and you are so right talking about how even though 2 women are on the show they never put them together!! I’ve never seen it. I’ll have to check it out soon.